Regional Information Center "CARPATHIANS" » VOLCANICS OUTCROP “CHORNA GORA” (“ВLACK HILL”). 48° 08′ 54″ N lat; 23° 05′ 13″ E long. Eastward from the Vynogradiv city on the right bank of Tysa River in the rocky cliff up to 500 m long and sometimes more than 100 m height which is additionally cleaned up during quarry construction, there are exposed andesites (Early Sarmatian-Pannonian, absolute age 10.1 Ma) that fill up volcanic neck. They are cut by dyke series of rhyolite and rhyodacite composition. The dykes are confined to the edge fault which bounds ring volcanic-tectonic uplift. Once appeared this uplift “Chorna Gora” existed as small cliffy island inside lake-marine basin which had covered territory of the modern Trans-Carpathian trough. Basin depth around the island varied from the first meters to some hundred meters. Uplift is preserved as mountain up to recent times due to its constituent rock resistance against erosion. 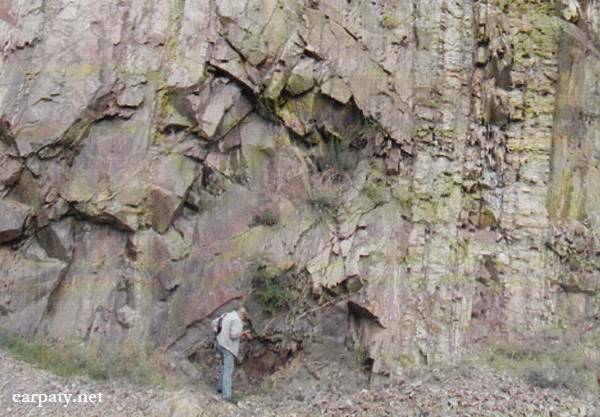 This outcrop seems to be good example for studies of volcanic processes in Trans-Carpathian region. At the cliffs foot there are impressive lake which had been formed over single night because of disclosure of the pressured fracture water horizon in the neighbor quarry. Accessible by motor-car. 1.4 km to the north from road bridge Vynogradiv-Korolevo (or railway bridge Uzhgorod-Sololtvyno). Same as 1 km eastward from the top of Chorna Gora Mountain. 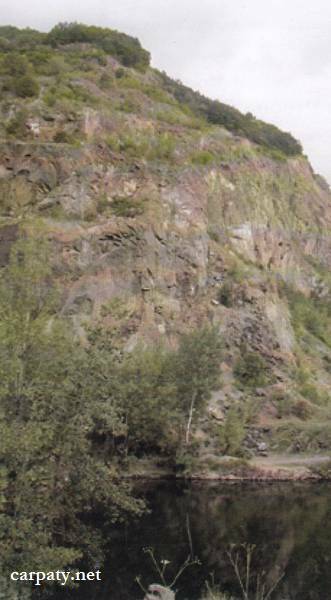 « ILNYTSKE OUTCROP OF BROWN COAL (LIGNITE).